You must make reservations at least 5 minutes in advance of the time at Cobblestone Bar & Grill. We offer valet parking for $10.00 for breakfast, lunch, dinner and weekend brunch. 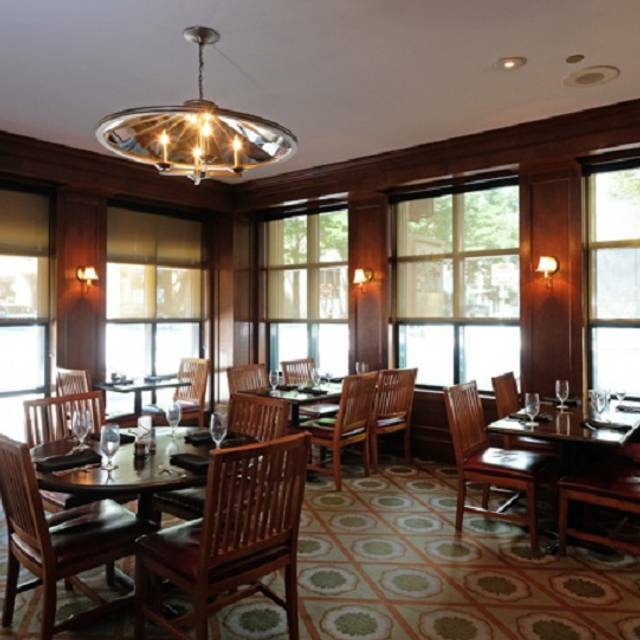 In the heart of Shockoe Slip, our casually elegant restaurant, Cobblestone Bar & Grill at The Berkeley Hotel. Cobblestone now offers a newly renovated private dining room; Founders Room, with a seating capacity of 30-35 people and standing room capacity of 45 for cocktails/appetizers. Founders Room is great for Rehearsal dinners, wedding receptions and holiday parties! Check out our 60 inch monitor for presentations and slide shows! 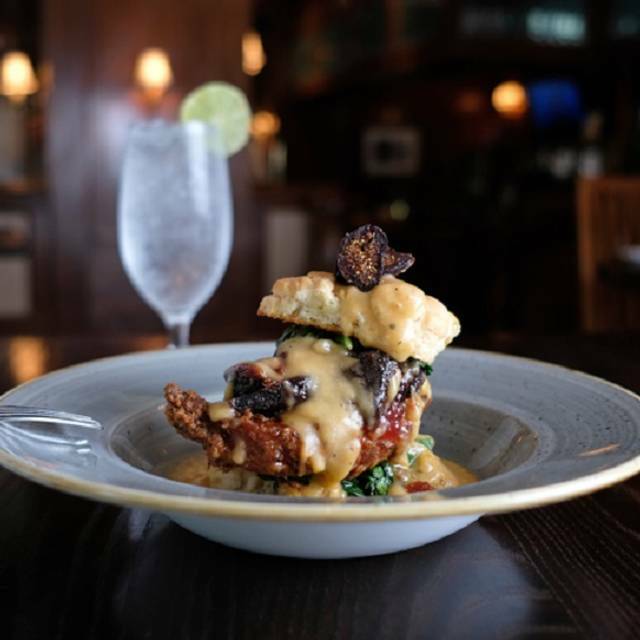 Cobblestone serves seasonally inspired regional dishes and southern inspired American cuisine. Cobblestone Bar & Grill serves breakfast, lunch and dinner daily. 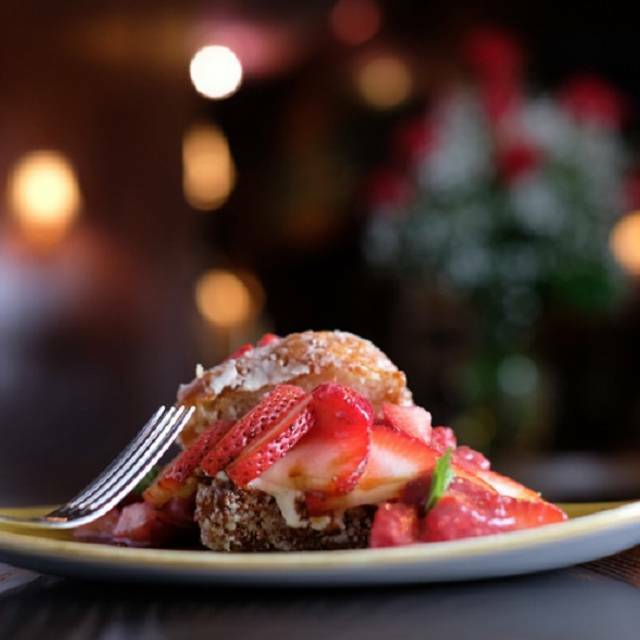 On Saturdays and Sundays enjoy our a’la carte brunch. Come enjoy our comfortable, inviting atmosphere and warm hospitality with a spectacular view of Shockoe Slip. 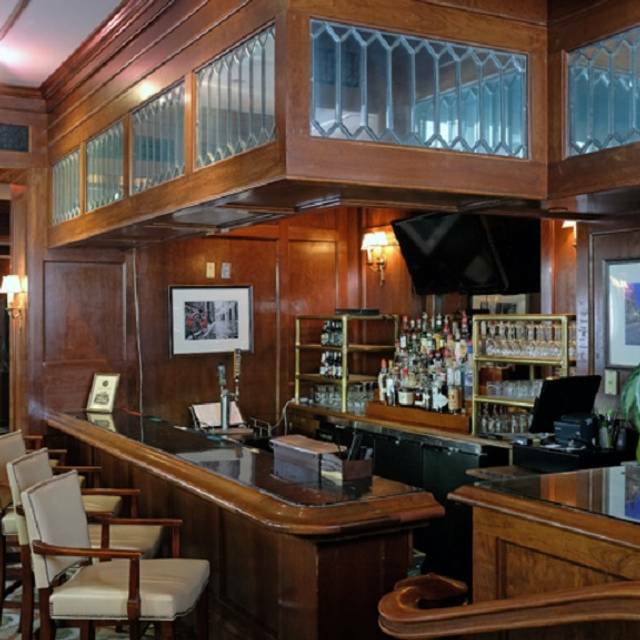 We also feature a separate bar with hand-crafted cocktails, a large wine list specializing in Virginia wineries and a lighter fare menu. Visit us soon; complimentary valet parking is always available to our dining guests. This is an excellent restaurant. It appears to be lacking in promotions by management to draw people in; which is a shame because it's a very cool place. It is located in a hotel; but don't let that fool you! It has an amazing staff and chef. Veronica was fantastic! She’s a great server!! We enjoyed a great meal, reasonably priced and delicious. The crab bisque had a nice hint of sherry and was very flavorful and had a small garnish of crabmeat as well. I enjoyed the fish of the day, monkfish, perfectly cooked and served on a delicious bed of risotto. The tomato and artichoke salad that served as a topping was excellent. Our server, Veronica, was very pleasant and attentive and adept at handling working as both server and bartender. We ordered a pecan pie that had been shown on the open table menu though it was not available. The chef Tony came to our table to let us know why it was not available, which was pretty impressive. Throughout our experience, we were made to feel very much at home and welcome and it was a great experience. The restaurant is by the front desk so it is not exactly intimate, however, the windows look out to the lovely cobblestone streets of the neighborhood so it does have charm. The southern flavor and southern hospitality was much appreciated. Surprisingly delicious food...even the salad tasted amazing. Now we know why Chef Tony Taylor deserves to be on Chopped. Located inside the Berkely Hotel. Parking is not the best due to downtown location. Service was great, servers very attentive. Food came out fast and hot. Crab bisque was delicious as were the crabcakes. Everyone enjoyed their food and appetizers. First time visiting Cobblestone Bistro inside The Berkley Hotel. Everything was great! They had a Valentines Day menu which consisted of 4 courses, and they gave each lady a rose. I thought this was a special touch. Our waiter was Will and he was fantastic. The chef even came out to ask was everyone enjoying their meal and to thank everyone for coming. Our meal here made our Valentines Day a great memory. Food was good but there was a social happening in the banquet room across the hall and it was way too noisy for a valentine dinner. This was my first time at Cobblestone and I was extremely satisfied with the food and the service. They were so accommodating and friendly. Last Christmas Eve we had a lovely holiday dinner here. Unfortunately this year did not live up to expectations. The food was not as good and neither was the service. While we were not anticipating high end gourmet fare, this is not an inexpensive dining choice and we were disappointed with the meager offerings. Next year's Christmas Eve will be spent elsewhere. The restaurant was lovely. The service was slow and they were not busy. They did not have spinach or the flatbread. Few vegetarian options. The food was good and visually appealing. Not what I expected, a little disappointed. We were seated very quickly and our request to move our reservations back 15 minutes because of bad traffic was quickly confirmed. The restaurant is beautiful, with large beams and an open feel. The elevated northern room, where we were seated, was roomy and comfortable. The food was below average. The bisque was not a bisque, but more of a chunky chowder, but was bland and tasted more of thickener like arrowroot than crab. The beef rib was also bland and packing the moisture one would expect with a short rib. It was tough and went largely uneaten. The lobster potatoes were good. They were whipped well and had chunks of lobster in them. I would order those again. The crab sandwiches were very good. They were fried well, and while the crab was mild, there was a proper proportion of crab to bread and the texture was spot-on. The service was average, even though we were the only table in the room. The only suggestion I have is to not charge for valet parking. I thought $10 was a bit steep. When we arrived there were only two other families having breakfast. It took over 45 minutes for them to serve us breakfast brunch for four people. When the food arrived it was bland and cold and we had to send back the Bloody Mary. Very disappointing when trying to impress out of town guest. What was some years ago an elegant dining room with excellent food has been down graded to an informal bar and grill. The lunch menu was adequate but the food itself was ordinary. We had dinner for an out of town customer, and everyone enjoyed their meal. The service, food, and atmosphere were excellent. This was a somewhat disappointing experience. The score for service is not a reflection of our server, but rather that there did not seem to be adequate staff to keep pace. It took nearly an hour to be served breakfast. The food presentation was underwhelming, including very small portions for the price. The restaurant itself is very nice, but the very slow service and quality of the food are not well aligned. Had a great Anniversary/Thanksgiving time! The staff from the time we checked-in until check-out was superb. We met the chef and your great bartender. Can’t say enough nice things. Thank you also for upgrading our room when you found out about our Anniversary! Can’t wait for our next visit!!!! We were disappointed with the Thanksgiving offerings (a Buffet) especially as compared with other Holidays we have eaten there in the past. Our meal was delicious and Veronica was an amazing server! She was attentive and super friendly!! The place was empty on a Sunday morning. Menu was limited and food was mediocre. SECOND TRIP AND IT WAS MUCH BETTER THIS TIME.....THE CHICKEN AND WAFFLES WAS TO DIE FOR....I HAD OUT OF TOWN GUEST AND THEY WERE IMPRESSED. FOOD WAS OK.....BUT NOTHING TO RAVE ABOUT....SHORT RIBS DRY AND TOUGHT....DRINKS AND THE SERVICE WERE TRULY FANTASTIC.....AND THIS WWOULD BE THE ONLY REASON I WOULD GO BACK...ALSO A COCKTAIL PARTY WAS ION PROCESS AND THEY WERE SO LOUD WE COULD HARDLY TALK TO ONE ANOTHER. Had the shrimp and grits. Had 3 nice pieces of shrimp. But it barely had any grits, like really a very small spoonful, and there was a very watery broth instead of creamy grits. But I will say the flavor was great. Wow - we hadn't been to the Berkeley to eat in years and decided to give Cobblestone a try. It was terrific. First and foremost, perhaps because we were relatively early (7pm reservations) we were literally the only people in the place for the first 45 minutes. That added to the ambiance as the space is intimate and comfortable. Service was terrific. While none of us got the server's name, she was very knowledgeable about the menu items, how things were prepared, and all of her recommendations were spot on. I had the short ribs with bourbon carrots and mashed potato's which was fantastic. My wife had the pork chop with drunken peaches - if you like bourbon this is the dish for you. None of use generally get dessert but the bourbon caramel bread pudding was to die for! Don't miss it. We will absolutely be back. We ordered the steak, the most expensive item on the menu, and it had loads of gristle. The bisque had a skin on it. We noted that it was our anniversary when we made the reservation and no mention of the occasion was made. (We actually had our reception there 20 years ago.) The host was not at the desk and we had to find someone to seat us. The staff was sweet but the food was terrible. Usually I am much harder on the service staff, but this was really bad food. Everything was fair. The food was tasty but I didn't really enjoy it. The waiter only had two tables and didn't pay attention to details. I took my family here to celebrate Mother's Day after church. The service was great, the price was right and the food was delicious. Everyone talked for the rest of the day about how great the restaurant was an how amazing the food was. We will be back. I had the absolute worse experience while dining here for my graduate celebration. Our food never came out, our drinks never came out and the management had the nerve to berate me and my guests. Another out of town couple and we stayed at The Berkeley and had our arrival night dinner in the Cobblestone Bar & Grill after drinks in the bar. Our server in the bar, Beth Ann, gave us a very personable welcome and excellent service. We wound up staying on long enough to be an hour late for our dinner reservation in the adjoining restaurant, but Beth Ann and our server in the restaurant were aware of our delay. Will, our server in the restaurant, did a very nice job for us and we found this was a good setting for relaxing after our respective travels. We also had very pleasant breakfasts in the Cobblestone Bar & Grill each of our four mornings during our stay at The Berkeley. Our breakfast server for three of the mornings, Jo, was especially personable and attentive. The best meal we have had in a while. We loved the white time and black fried rice!!! The craft beer selection is always stellar! Very nice ambiance and atmosphere. It's not crowded and they were very accommodating. I wanted something that was not on the menu and our waiter went above and beyond to ask the chef if this could be done. Needless to say they could make the meal that I desired and everything was great! After our meal my friend was trwated to a complimentary dessert for his birthday. Our bartender, Beth Ann, was excellent. She recommended 2 wines that we really enjoyed. Will, our waiter was excellent and the food was really good. we also enjoyed talking to Tony, the chef. An all around good experience.